Despite knowing the challenges that he was to face, Italy’s Alessandro Maestri decided to embark upon a journey that no other Italian has embarked upon—destination: Japan’s Shikoku Island League. Maestri told Italian Baseball Softball Federation (FIBS) that the “compensation” is helping to confront any symptoms of culture shock. The right-handed pitcher will be suiting up for the Kagawa Olive Guyners, as part of their 22-man roster, which will be competing in 90 games this season. 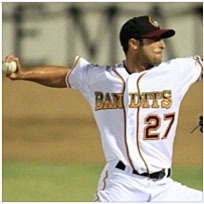 During his adventurous baseball career, Maestri has put on the jersey of the Italian National Team and reached the third highest level of Major League Baseball, Double A. He most recently played for the Brisbane Bandits of the Australian Baseball League and played for Team World in that league’s All-Star Game.